If you live in Texas, then chances are you might have had a brush or two with poison ivy. I know I have! 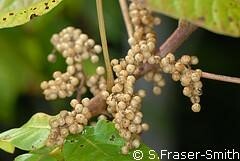 It’s a sneaky unassuming vine that can cause weeks of itchy blister-filled anguish. 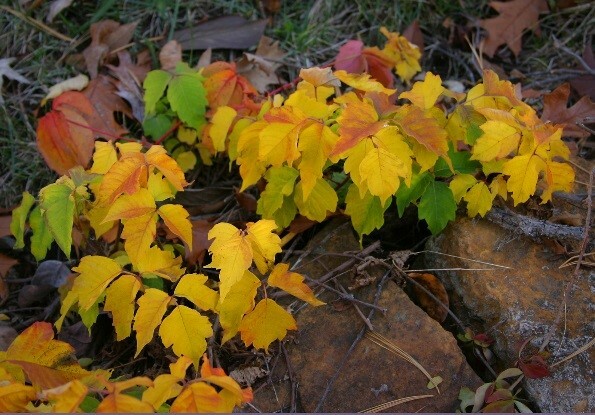 Poison ivy, Toxicodendron radicans, belongs in the family Anacardiaceae, more commonly known as the sumac and cashew family. Can you believe that cashews and poison ivy are related?? Why can we eat one, but have a potentially severe rash when we touch the other? 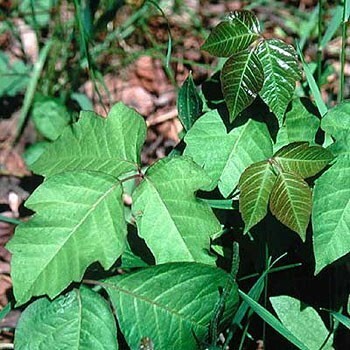 The answer is that poison ivy is among the handful of plants found in the genus Toxicodendron that contain the compound urushiol. 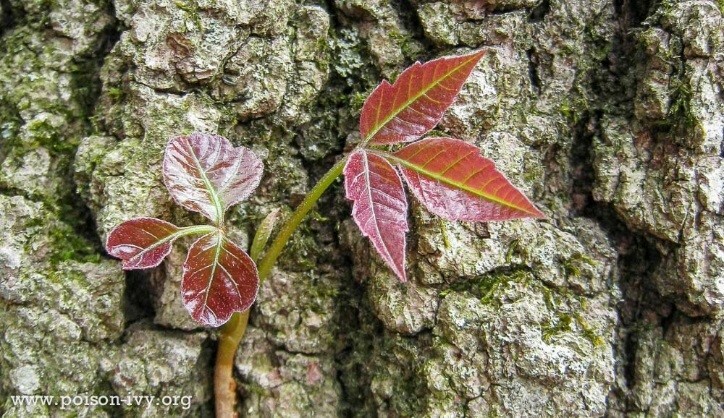 The genus Toxicodendron comes from the Greek words ‘”toxikos-” which means poison and “-dendron” which means tree. Urushiol is a nearly invisible oil-like compound with allergenic properties and is the culprit behind the agonizing rashes. Poison ivy doesn’t actually contain any poison, but rather a powerful allergen that elicits an immune response. Leaf shape and size can vary, even within the same species, which can make identifying this bad boy difficult. 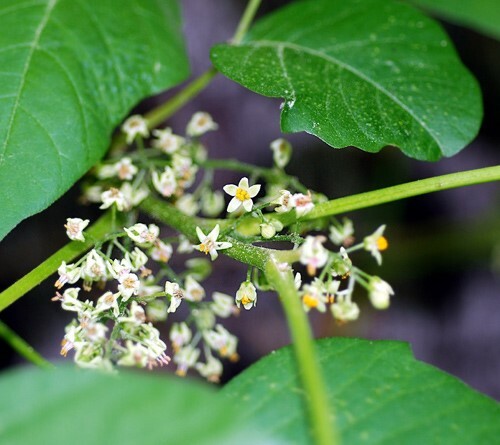 It is most commonly found as a vine, but can also grow like a bush. When trying to identify, start with the most basic features. DID YOU KNOW?? The skin of a mango also contains urushiol and can cause similar rashes if you are also sensitive to poison ivy. Question 1: Does it have leaves? 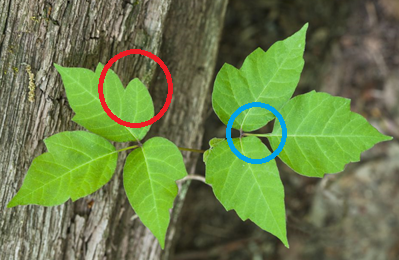 Poison ivy has 3 leaflets that extend out on a long petiole from the stem of the plant. The center leaflet will be the largest and is symmetrical with a center vein and always has a longer stalk than the 2 side leaflets (see blue circle below). The side leaflets are slightly smaller than the center leaflet and asymmetrical, have very short stalks, and usually have a “mitten” shape with the thumb facing outward (see area circled in red below). Each leaf will always have a pointy tip. 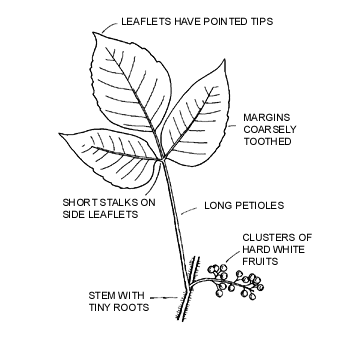 The edges of the leaflets can be smooth, irregularly toothed, or even lobed. Leaf color also varies greatly depending on the time of year. In the spring, new growth will be mostly red with some green. In the summer the leaves will be green and lush and in the fall the leaves range from yellow to orange to red. Question 2: Do the leaves alternate along the stem? Each leaf will alternate from left to right along the stem. DID YOU KNOW?? Poison ivy isn’t harmful to deer, in fact, they prefer eating it over other plants! Question 3: If present, are there small off-white flowers of berries? Tiny off-white flowers with yellow centers develop through the spring are found in clusters. Grey or off-white berries form in the fall and are delightful treats for birds who aren’t affected by the urushiol. Question 4: Does it have a brown and hairy rope-like vine? 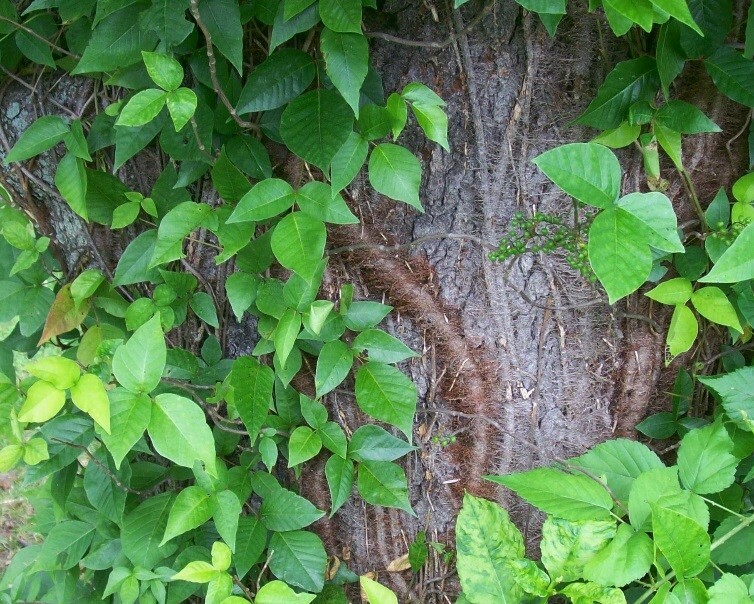 Mature ivy becomes characteristically brown and “hairy.” These hairs are actually aerial roots, and act as tiny little hands that help is grasp on to the trunk as it climbs. Theresa is the horticulturist at the Cockrell Butterfly Center. She maintains the rainforest atmosphere of the Butterfly Center and propagates plants for the spring and fall plant sales. She has a background in entomology and is specialized in raising tropical butterflies, so the CBC is her heaven!